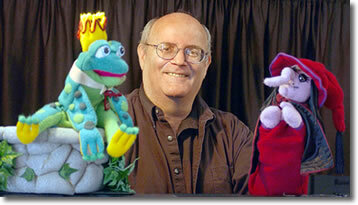 PUPPETS TO GO was founded by Bob and his wife, Elise, in 1979. In addition to performing at schools, museums, theaters and libraries, he has performed at regional and national puppetry festivals throughout the U.S. and Canada. Bob received his training in puppetry at the Gramercy Puppet Theatre in New York City with Lea Wallace, and at the National Theatre of Puppet Arts in Great Neck, New York, with Carol Fijan. Bob uses music to help evoke a wide range of moods in each production. It is his strong writing background, however, that makes any PUPPETS TO GO show memorable. Stories may be amusing one moment... sensitive and touching the next. Wherever he performs, Bob, along with his cast of unforgettable characters, educates the mind and entertains the imagination. • Puppeteers of America, Inc.